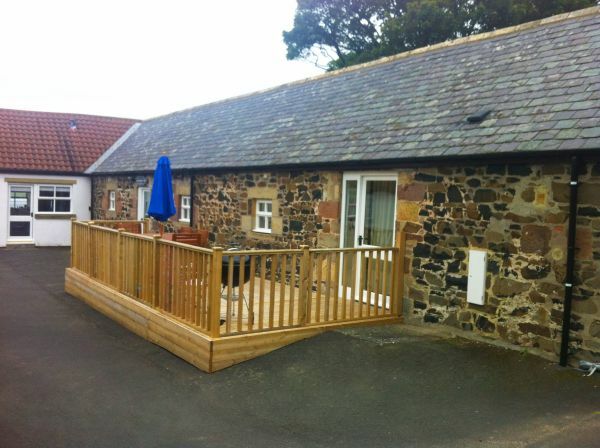 Dairy Cottage is a converted sandstone farm building with a traditional slate roof. It is a deceptively large holiday cottage on one level (please note that there are two steps between the lounge and the hallway to the bedrooms) where our interior designer has created a well-appointed modern and contemporary feel. It has three spacious bedrooms sleeping six people. A large central courtyard provides ample car parking. The grounds that surround the cottages have been landscaped to provide adequate leisure space. There is a separate, fenced paddock area which makes this the perfect safe and secure area for children and dogs to run around, to play games and have loads of fun. Garden furniture, games and a barbeque are provided for everyone. The rural setting offers delightful views across the open countryside. This is a handsome restful base from which to explore an area of outstanding natural beauty. Dairy Cottage is part of the Bamburgh First Dukesfield collection and therefore has access to the newly built Gathering Place where you can play games on the wii, table tennis or sit and read a book. For more information about the Gathering Place pleaseclick here. There is also a new tennis court, hot tub and children's play area exclusively available for guests of Bamburgh First at Dukesfield. The kitchen is large, very modern and well-equipped with all the essential, superior accessories and deluxe fixtures including a stylish cooker, hob, dishwasher, washing machine, fridge/freezer and traditional Belfast sink. Meals can be taken on a natural wood dining table seating six in the large dining area. The open plan living room is an attractive space which has been tastefully furnished for relaxing and entertaining. 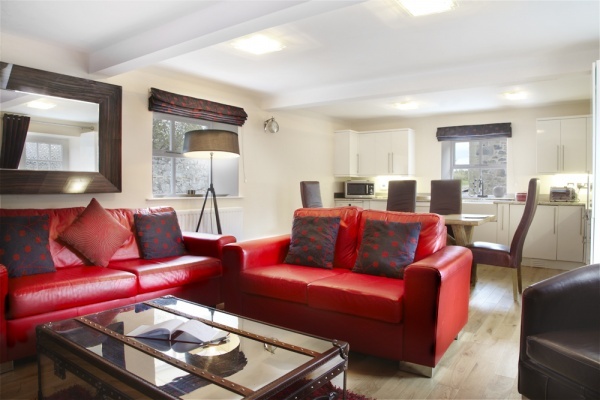 This room boasts real wooden floors, a log burning stove, a large flat screen TV with full Sky package, free WIFI access, large comfy sofas and modern, contemporary furniture. 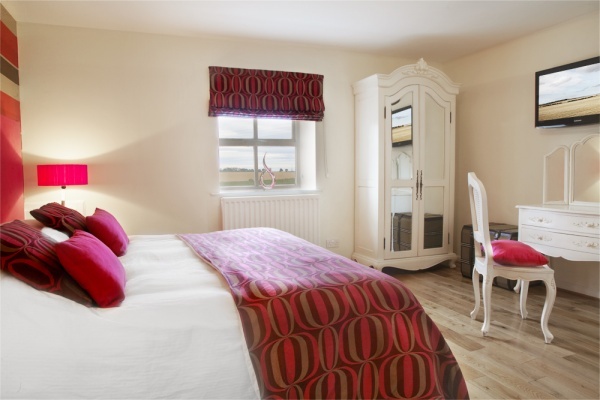 The Master Bedroom with en-suite shower room is a superbly designed room with a Super Kingsize luxury bed, bedside drawers with lamps, a dressing table, large wardrobe and a wall mounted flat screen TV with the full Sky package. 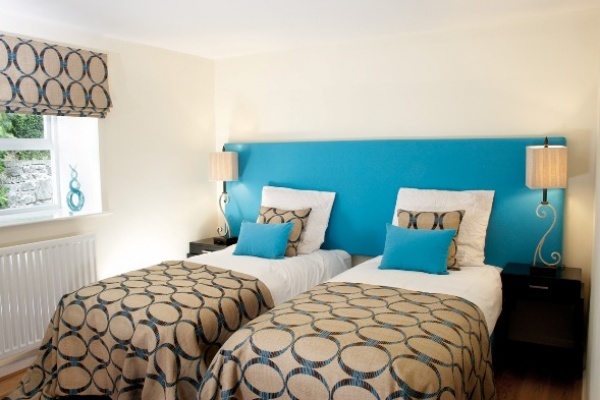 The Blue bedroom has two luxury single beds, bedside tables with lamps and storage space for your clothes. 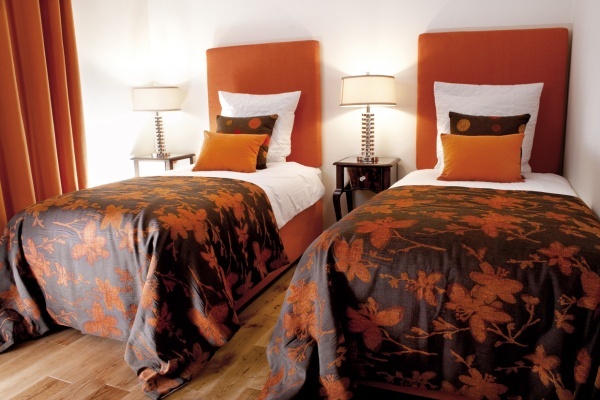 The Orange bedroom also has two single beds with bedside tables, lamps and a bespoke hanging suite and vanity unit. Dairy has a good sized family bathroom which has been travertine tiled throughout, a tasteful white suite including a bath and walk in shower, and a skylight providing an open effect. This cottage benefits from a private decked area to the front of the property with outdoor furniture and a BBQ for alfresco dining in the sun.